In the days following Pearl Harbor, the Japanese overwhelmed the U.S forces in the Philippines and the Solomon Islands, and attacked the British in Singapore, Burma and New Guinea. As the Japanese advanced, General Douglas MacArthur, commander of the U.S. forces in the Philippines, was ordered to leave the islands in March 1942, with MacArthur making the famous pledge as he departed for Australia, "I shall return." It is with broken heart and head bowed in sadness, but not in shame, that I report to Your Excellency that I must go today to arrange terms for the surrender of the fortified islands of Manila Bay......If you agree, Mr. President, please say to the nation that my troops and I have accomplished all that is humanly possible and that we have upheld the best traditions of the United States and its Army. Despite MacArthur's failure to protect the U.S. bombers from being destroyed on the ground by Japanese air assaults and other mistakes he committed in defense of the islands, he was awarded the Congressional Medal of Honor as the Roosevelt Administration attempted to salvage some positive news from the humiliating surrender. 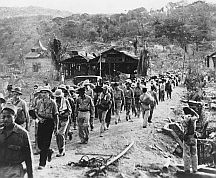 Following the surrender, in the Bataan "Death March," the Japanese forced their American and Filipino prisoners to march some sixty-five miles through intense heat with little water or food, with an estimated 5,000 to 11,000 dying before reaching the Japanese prison camp. ﻿ By failing to follow up their attack on Pearl Harbor to destroy the remaining U.S. fleet, however, the Japanese allowed the Navy to recover quickly, particularly by utilizing the aircraft carriers that were not in port at Pearl Harbor on December 7. In April 1942, primarily to restore morale of both the military and of the civilian population, Tokyo was bombed in the celebrated "Doolittle Raid," led by Lieutenant Colonel James H. Doolittle, launched from the aircraft carrier Hornet. The bombing did little damage, but surprised both the Japanese and American public after the early round of Japanese victories. ﻿ ﻿The Doolittle Raid also was followed by Japanese miscalculations which ultimately shifted the momentum of the Pacific War. In the mistaken belief that Doolittle's bombers took off from the airfield on Midway Island, the Japanese fleet was ordered to respond by attacking Midway, but met unexpectedly strong resistance in May 1942 in aircraft carrier-based battles in the Battle of the Coral Sea. In the Battle of Midway in June, the Japanese suffered a devastating defeat, losing four aircraft carriers that had participated in the raid on Pearl Harbor as well as over a hundred of their best pilots. 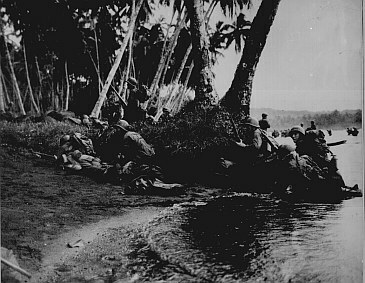 The Allies then launched a counter-offensive with Marine landings on Guadalcanal and nearby islands in the Solomons. 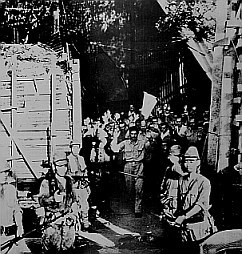 Simultaneous Army campaigns headed by General MacArthur with the aid of Australian troops also succeeded in driving the Japanese from New Guinea. In November 1943, after heavy casualties, the Marines also won control of the Tarawa and Makin islands in the Gilberts chain. See John D. Hayes, The War in the Central and Northern Pacific, Grolier Online; World War II History Info: The Pacific Theatre. ﻿﻿ In early 1944, the U.S. also took the islands of Kwajalein, Roi and Namur in the Marshalls chain. 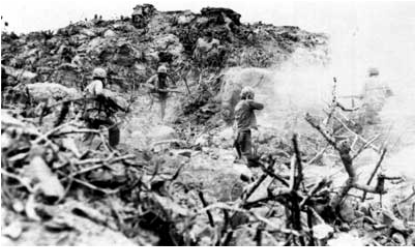 The loss of Saipan in July 1944, which was heavily fortified with 30,000 troops and considered by the Japanese as the key to the defense of their home islands, also provoked a political crisis leading to the fall of the government of Emperor Hideki Tojo. In a desperate effort to regain the initiative after the defeat on Saipan, the Japanese undertook a poorly-planned air attack on the U.S. fleet off the Marianas, losing over 400 planes to only 30 for the Allies. Without the protection of the carrier planes, the remaining vessels of the Japanese fleet became vulnerable to air attack and were forced to return to waters closer to their home islands. Less than two weeks later, President Roosevelt died in Warm Springs, Georgia. With the surrender of Germany in May, the final decisions on how to bring the war in the Pacific to a close would be left to President Truman. Given the extensive casualties suffered in taking both Iwo Jima and Okinawa (where 12,000 Americans were killed and another 50,000 wounded), Truman was confronted with whether to proceed with the invasion of the Japanese home islands or to use the new weapon which he had only learned of upon Roosevelt's death, the atomic bomb.